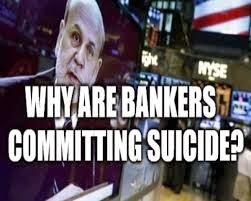 Lee Ann Mcadoo from InfoWars Nightly News goes over the latest banker suicide, making 12 officially, although in a previous Alex Jones, Gerald Celente interview, it was asserted that at least 20 lower level bankers had also died. While the title says experts are baffled, this was something that was predicted when the death count was only at four, and a warning went out from “V” The Guerrilla Economist, via Steve Quayle, that there was a hit list and approximately 43 names were on that list. More about this in the video below.